It’s been quite some time since anyone has heard from Glasvegas, one of our favorite bands from 2009. They’ve got a new album coming out in approximately 70 days according to the band’s site, and it’s titled Euphoric /// Heartbreak \\\ Album. One change is the band’s line-up, which now includes a new drummer. That’s definitely going to change their sound a slight bit, probably making it a lot more dense, which you can hear by listening to the first single from the album, “The World is Yours.” Our hopes are that this record is an engaging and full of bombast as their last effort. Fingers crossed ladies and gents. From the depths of the Glasgow music scene burst forth another band in 2003. Since then, The Twilight Sad have slowly been building up a reputation for their melodic rock meets shoegaze, creating beauty surrounded by squalling guitars. Fourteen Autumns and Fifteen Winters won over many critics, and the world was eager to see if Forget the Night Ahead could keep the band riding the wave of popularity into the hearts and ears of everyone. As “Reflection of the Television” opens the album up, you can see the screaming feedback you can see that the band still has some of their traditional elements in place. But, you will also notice that those elements no longer live in the foreground of the song, as they did on previous efforts. Singer James Graham now has his vocals standing before you for all to see, and while it dramatically changes the aesthetics of the release, you still catch onto the power of music. “I Became a Prostitute” is the band’s first single off this album, and you can see that it definitely has a presence that can rise above the indie status. Like Glasvegas, it’s a grandiose number full of wave upon wave of guitars accompanied by Graham’s vocals, which just so happen to crash atop the song as well during the chorus. All in all, it’s a softer approach to writing than the group took in the past, but for most listeners, you will find that it’s equally as effective. Fortunately for us, this album is longer than their previous affairs, despite the fact that each song reaches well beyond the mark of 3 minutes, with most running near the five minute mark. However, the dynamics of the atmospheric guitar flourishes combined with Graham’s new vocal presence do make some of the songs blend into one another, making it hard to differentiate between the album’s best numbers. Don’t take this to mean that there aren’t standout tracks in abundance. “That Birthday Present” is a clever song, with the majority of the tune relishing in the bouncy guitar work. All this comes to light even though this also happens to be one of the noisier songs on the record. The Twilight Sad at this point seem sort of like a cross between M83 and Mogwai, except they rely upon a more traditional songwriting structure. It allows their songs to breathe, instead of wallowing before they fade into obscurity like other bands that implement noise attacks. “Floorboards Under the Bed” is different than most tunes you’ll find in the groups catalogue. It seems to wear the influence of tour-mates Frightened Rabbit, but then it fades into a piece of tinkering flare. Albeit an interesting opening, the song quickly disappears into the back of your mind. All the build up will lead you into the final three tracks. Of the final three, “The Neighbours Can’t Breathe” is the stand out, although the closer, “At the Burnside,” has an emotional appeal, with a hint of Glaswegian balladry wrapping it all up. This album has some really beautiful moments, more than way out the few weak points. The Twilight Sad are able to build upon their own sound, pushing the shoegazing into the realm of a more pop-centric world, and Forget the Night Ahead wins because of its ability to step into these new realms, encouraging the band to become more than just another stagnant noise-rock act. Sweden’s The Mary Onettes have long been one of those bands that I wished everyone would get into, as they clearly deserve the recognition I’ve built for them in my brain. Perhaps some will find them drenched in nostalgia, but their self-titled debut showed that they could rise above and beyond limitations of the past. So here they come with their first release in a few years, the Dare EP. Right away, you sort of have to knock it down a bit based on the fact that there are only three songs on the EP, which is short, even for EP standards. In the end, you find that this is possibly the only knock on these exceptional tracks; you’ll find nothing else wrong here. “Dare” is the opening track, and one I threw your way earlier on in the year. Opening the song you have a swirling guitar sound reminiscent of the opening moments of “Geraldine” by Glasvegas, though the lyrics here will delve further into true meaning than some of the simpler lyrics by the latter. Also, as with most current bands, the melodious moments are accompanied by layers of atmospheric guitar screeching and pounding drums. Everything about this song sums up carefully the abilities of The Mary Onettes when they’re at their best. Following the opener is “Kicks.” It’s a far cry from most of their earlier work; it’s clearly more subdued in mood and pacing. This is one of the first songs in their career that I feel is driven by the vocals and lyrics rather than the beat. Broodingly gently piano accompaniment continues to push this song into traditional ballad format. “God Knows I Had Plans” closes the Dare EP with a shimmering wall of guitars and harmonies. A certain warmth exist on this song, which immediately implies a certain craft leaning towards soundscapes. This is perhaps a fitting association, though they fill the traditional elements with belting harmonies and pounding drums. It’s a really short effort, but at its best, it portrays a band pushing beyond the boundaries of their glorious first efforts and bounding forwards towards new horizons. Expect to continue to hear brilliant moments from this band in the near future. Damn you Daytrotter! We promised these people no more posts about Glasvegas and then you go and do this! 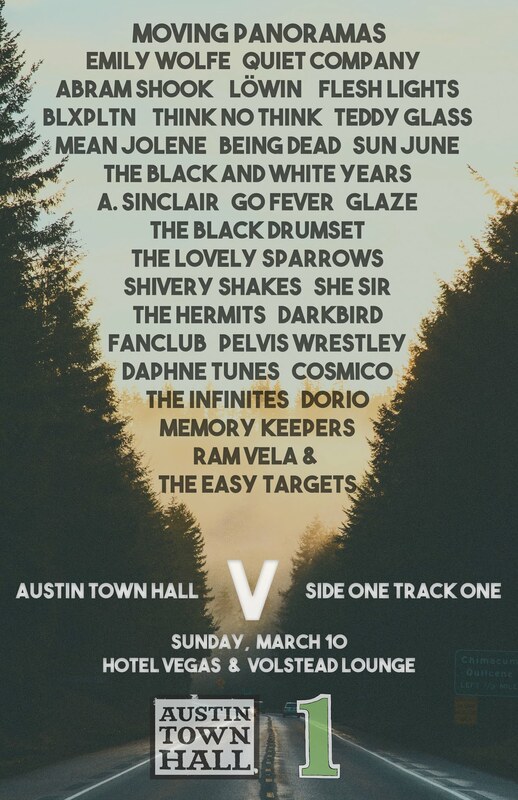 What we’re talking about is a new series of live performances on the Daytrotter website featuring bands recorded during SXSW. The sessions are extra special because each band takes a few of their songs and turns them into acoustic mini-ballads. Right now the site has sessions posted by our very own Strange Boys and of course ATH favorite Glasvegas. Check out this cry yourself to sleep at night version of Geraldine (also one of our songs of ’08). Keep checking back to daytrotter often as more sessions are said to be on the way.